The APRS is an Arduino, basically. We may be able to write it into the sketch, or put the Ardupilot and APRS on the same I2C bus and not have to change the APRS system much. The APRS sketch said it took ~57% of the 328P’s memory, I think, so there ought to be room on the APRS system itself. What kind of input / interface does the Ardupilot expect? And for perspective, how difficult / expensive will it be to get a replacement GPS module? Edit: need to check if the APRS gives us I2C pins to tie to. The GPS/Compass boards are cheap, like 20 bucks. Definitely cheap enough to not mess with trying to customize the APRS. I also think it would be beneficial to have the APRS and APM completely separate, giving us at least some redundancy. Ok, then it’s not worth it. Also, Harold was proposing moving the meetings to Wednesday to avoid conflict with board meetings. I don’t personally have an issue with this, so we’ll go ahead and move it to Wednesday nights at 7pm, bi-weekly (as is tradition), starting in 2 weeks. That will mean that the event calendar will need to be adjusted. Meeting is to be this coming Wednesday at 7pm. I haven’t been up to the makerspace in a little while. Did you leave the APRS board up there somewhere, Nick? Need to bring the new cutter FETs, and some NiChrome. IMPORTANT: Build day on Sunday, 2pm. My coworker brought up that this coming Sunday is the Superbowl. I completely forgot about this while we were planning the workday last night. I don’t have any plans to watch the game, but I want to make sure y’all didn’t forget any Superbowl-related plans. Please let me know; we can move it to the next weekend if everyone will be watching the game this Sunday. Nick brought the APRS board last night. I don’t know where (or if) he left it, as I was the first to leave. Harold and Nick both worked on the HitL stuff some. I left before they finished, so I don’t know what state it’s in now. 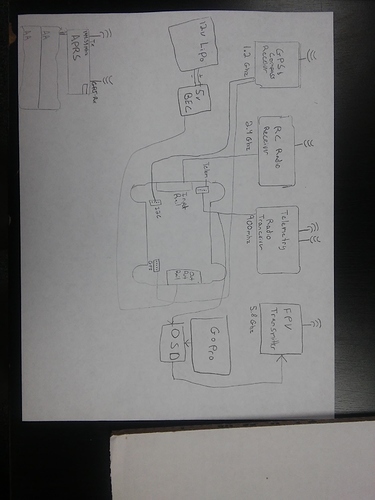 We (Nick, mostly) started an electrical wiring diagram. I have a picture on my cell phone which I will upload. This is arguably the most productive thing we could have done, since it strongly defines the electronics package (I didn’t / don’t have it all memorized) and gives a clear picture of what needs to happen for the electronics to be ready; it’s a big deal since electronics is by far the least ready part. Probably the most interesting thing is realizing how many radio devices we have. Jay (from Digital Media) showed up and asked several good questions. His questioning reminded us we never did start the wiring diagram and we really needed one. Jay expressed interest in creating an antenna tracker that’s complimentary to what we’re doing. I like the idea, although I don’t think it’s strictly in the scope of this particular project. I’d like to see it happen. I think everyone that was there said they wanted an antenna tracker for their own purposes, so I kind of think having it as a separate, somewhat broader project is probably more appropriate. That being said, if Jay makes one and makes it available for the balloon, I’m planning on using it. I might help work on it some, too. I just don’t intend to make it a focus within the balloon project, since it’s not required for our objective of a drone launch. Jay also asked us about taking video, pictures, and other publicity-related things. I haven’t really done much public outreach besides this thread and a severely neglected wiki page. I’m all for it. Jay asked about permission to edit video we generate; I certainly don’t mind. The way I see it, this project is makerspace-scoped (i.e. a group project), so it doesn’t make a lot of sense to me to restrict part of the makerspace from being involved in a makerspace project. Particularly if they want to do something cool. He also brought up having makerspace logos on the drone and / or payload box; we will do that. Finally, he asked us which logo we’d prefer to use; I don’t think any of us were particular about that. Of course, if we’re going to print labels and put them on our vehicles we will need to choose eventually. He also took some pictures of the current state, so we can have some documentation and be able to refer to them later or use them in a write-up. We talked about getting back in touch with the other committees who had expressed interest in sending payloads up: science and ham radio. Not sure what will be of the ham radio interest (whoever wanted that should still be able to participate independently of the committee), but we probably do need to find the science chairperson and ask them about what they’d like to do. We brought up skipping the “training launch” and going straight into a drone drop. The main argument was the additional workload was not too significant, so it wouldn’t delay us by that much. Since both Nick and Harold know quite a bit more about drones in a practical sense than I do, I am assuming they’re right. I think that what we should do will become clear as we go along; if it starts to look like the drone is becoming inordinately time-consuming, I think we probably should do a normal payload launch, but otherwise I assume we will probably will be able to skip to a drone. So we might as well do that. In light of the minor debacle that occurred with our last NiChrome holder box experiment, I drew out the next iteration on paper. I will need to go through and address fit issues, hinge alignment and such, then move it into CAD, then print it. But the concept should be clear now. I will upload a picture of the drawing soon. We discussed launch / landing site selection. If we go straight into a drone that can glide properly (either autonomously or not), then we no longer have to try to “aim for” a landing site the same way we would with a normal payload box. In related discussion, local regulated airspace (class B, C, etc.) avoidance was brought up. While Harold did discover the balloon probably wouldn’t run afoul of any FAA rules related to this, it would probably still be a good idea to avoid these areas if we don’t have a compelling reason to go through them. And since our main reason for travelling through some of these was our previous landing site selection, we may want to re-evaluate on that basis alone. Long story short, we need to rethink this some. Probably the easiest thing to do is drive out of town a few hours in an arbitrary direction and launch from a reasonably rural location, but we need to discuss this further before any decision is made. And of course this hinges on flying the drone; if we fall back to a payload box, we’ll also go back to our original launch / landing site selection method of finding the biggest, most open place to target for landing and determining our launch site on launch day based on the determined landing site and the weather. I’d like to experiment with a monthly weekend workday. It’s clear there’s not very much time to both discuss things and get a significant amount of work done during the bi-weekly meetings. In addition, if anything goes wrong (say, if someone forgets to bring something, or a GPS module walks off), it’s very easy to lose a month of time getting it resolved; having a day dedicated to things makes this less likely. And finally, the one workday we had a few months ago was extraordinarily productive, with the box construction, parachute drop-testing, etc. ; it was easily more productive than any of the weeknight meetings have been. That’s really what we need: to focus down the last bits of the project so we can GO FLY! 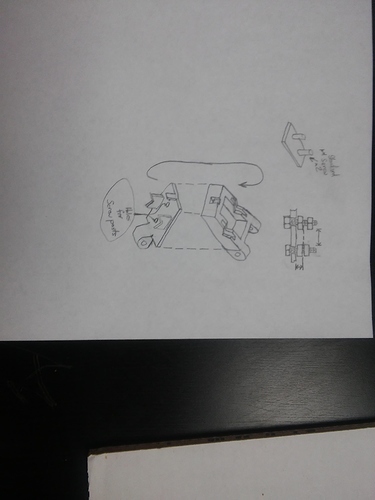 Nick’s wiring diagram as of the time I left on Wednesday. Okay, and a general idea of the NiChrome box thing. Almost forgot, meeting TOMORROW at 7pm. I’m interested in this project, when is the next meeting? It’s biweekly, next meeting will be week after next, Wednesday at 7pm. We’ll do a monthly weekend workday the weekend after that meeting on whichever day is most agreeable. Alright, it’s That Time yet again. 7pm, as is tradition. Without a turnout, a workday wasn’t planned, so we ought to plan it here. Saturday or Sunday, and what time? My vote is for Sunday at 2pm. Ah hell, knew I was forgetting something. We seriously need to just get this project DONE. For serious. 95% of it is electronics. Is the ardupilot being left at the makerspace? Nick, did you ever buy the gear you were planning on getting for the project? Can you start leaving the APRS board up in the RC/Aero storage in the warehouse? I found the NiChrome at my house; I’ll put that somewhere in the balloon stuff at the Makerspace. Last time, I was able to locate the majority of the electronics on the shelf in the aero corner. I think I’ll bring some of my own servos and mess around with the Ardupilot. Maybe I can get it to actuate the cutter too. Pretty sure this is still 90% electronics integration left to do, so I believe that’s what I’ll work on. So I worked with this Pixhawk a bit, figuring out how it do. I wasn’t able to find a tx/rx I could run this with, so likely I’ll get my own soon. I have this super old and super dead Hitec Laser 6, with the receiver … somewhere. I will also need to find or buy a battery for this stuff, just to run the system, and maybe a PWM->PPM converter, not sure yet. Sorry I’ve been a bit AWOL on this - the new meeting time has proved tough with my work schedule. I’m thinking we should plan another Saturday work day to work on electronic integration. @CKraniak, @hasbridge, & Jay - How is this upcoming Saturday, April 2nd? I don’t think I have anything going on this Saturday. I’ll probably go ahead and plan to be up there.